Ricky Hanlon was a tall and stylish player from the Derwent Valley who carved out a career in football as a coach and development manager in Tasmania and Queensland. 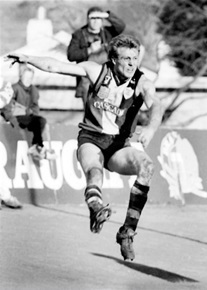 He began his playing career in the early 1980s with New Norfolk and then spent time with North Hobart before concluding his playing days while coaching Scottsdale in the NTFL. Since leaving Tasmania, Hanlon has spent a further 12 seasons in football development in North Queensland. His work has seen him undertake management roles, including specialising as the State Indigenous Programs Manager for Queensland in recent years. Combined with his work in Tasmania, Hanlon has spent nearly 25 years developing the next generation of Australian footballers.